Africa Fashion Week London in collaboration with Mahogany Productions and Ebonyworths are taking the Nigerian Fashion Designers beyond borders with the launch of the 1st of its kind reality TV show and competition for emerging designers Nigeria's Next Top Designer (NNTD). 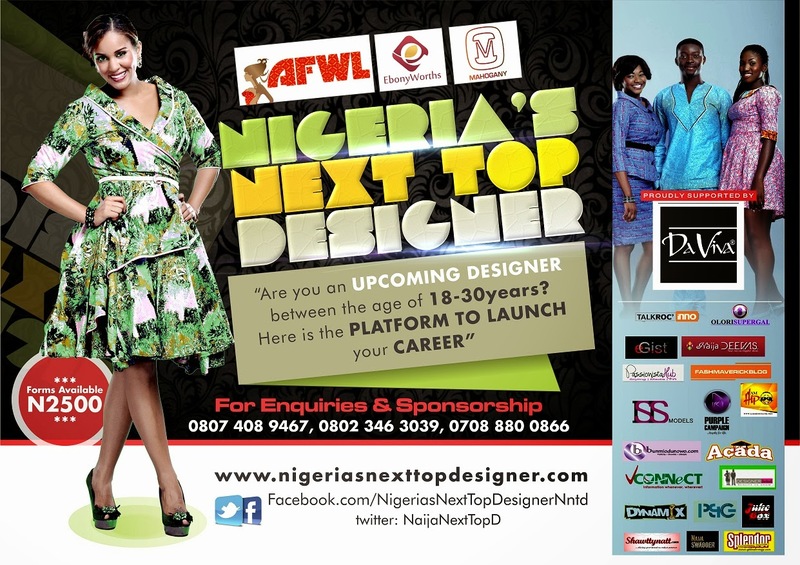 NNTD seeks to pave the way for the next generation of Nigerian designers. NNTD a Nigerian reality television series and a runway competition that will air on local and international TV stations.It aims to help in building local productive capacity, supporting local value addition, promoting entrepreneurship and empowerment. ALL THE FINALIST GET TO KEEP THE SEWING MACHINE GIVEN TO THEM TO WORK WITH. ALL THE CONTESTANTS WILL BE PROVIDED WITH A DAVIVA FABRIC TO MAKE AN OUTFIT FOR THE FINAL AUDITIONS ON THE 30TH OF NOVEMBER. If you are a designer who would like to participate in NNTD , please pick up an application form from the NNTD office, 1 Cottage Drive, off Abeke Animawun, off Durosimi Etti Lekki Phase one Also (3rd floor) No6 Olorunishola Street Off Avenue Off Allen Behind Alade shopping mall BEFORE THE 30TH OF NOV TO PICK UP YOUR DAVIVA FABRIC.